For those logging in for the first time, Epic Seven can be overwhelming. Its interface is just as complex as the content; multiple completely different game modes demand rigorous strategizing and resource management. Covered in this guide are the basics of navigating the app. While the periodic ingame tutorials provided decent exposure, this is meant as a reference that can easily be read or skimmed all at once. 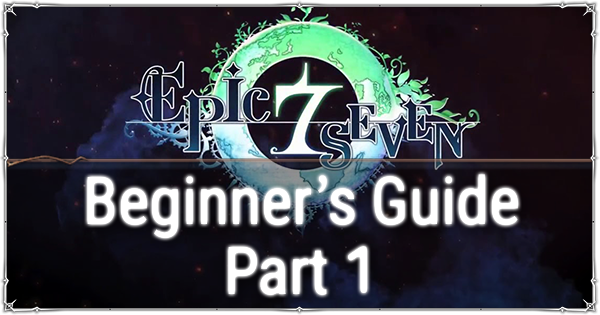 Part 2 covers the more advanced pointers for beginners who are already immersed in gameplay. 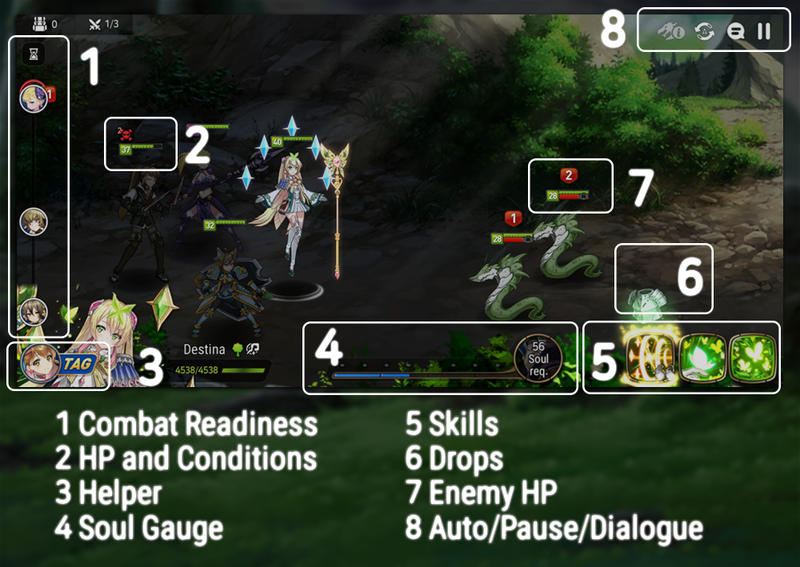 Also worth checking out are the Reroll Guide and Combat Basics. 1 User Info includes the username, Rep Hero, and Player Rank. 2 Press this to go to the Sanctuary. 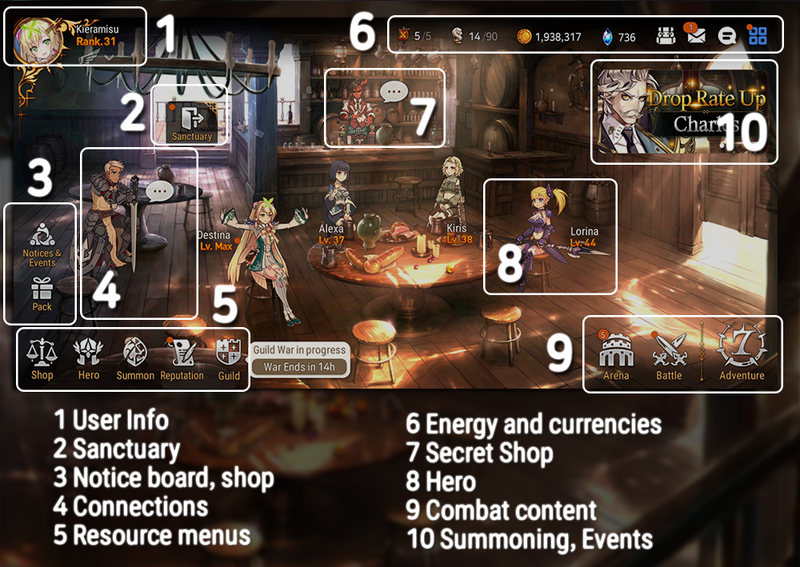 4 The Connections menu displays a number of quests which can be completed to recruit new Heroes. 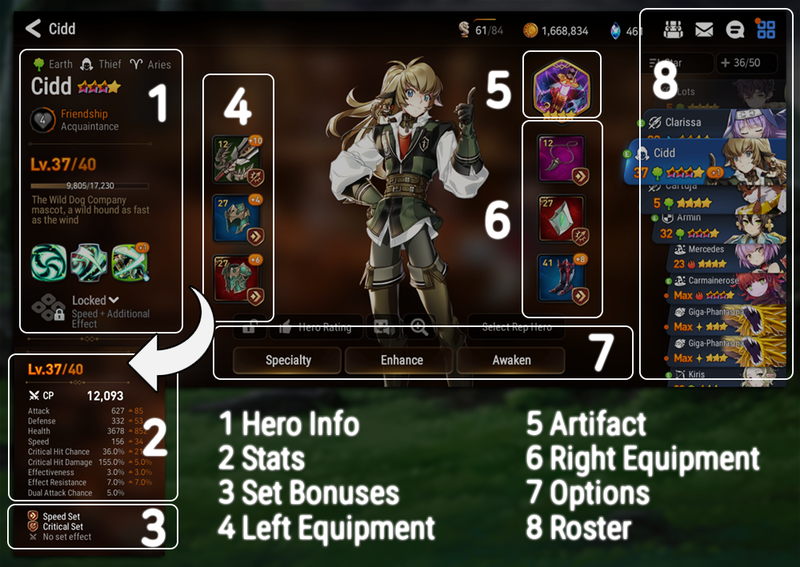 5 Resource Menus all have to do with building Heroes. 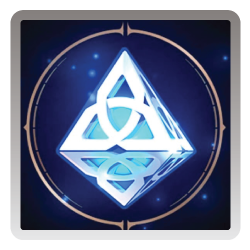 The Shop contains various microtransactions but also currency exchanges that are essential to progression. The Hero menu contains all the options for customizing and building a team. 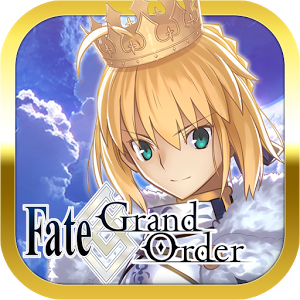 Summon is the gacha, while Reputation pulls up a list of Quests that reward various materials. Finally, the Guild button brings up the page from which players can join and access Guilds and Guild Wars content. 6 This display changes depending on which screen is being viewed, but will always have a combination of Energy and Currencies. In the Lobby, it’s Arena Flags, Energy, Gold, Skystones, and then the interface. 7 The Secret Shop sells a rotating stock of Materials. It’s worth checking every hour for new stuff-- sometimes, there will be great deals on Covenant Bookmarks! 8 Tap any Hero to upgrade, Promote, Awaken, or configure. 9 Combat Content sits in the lower-right. Arena and Adventure buttons lead directly to those game modes, while Battle links to another screen listing the remaining game modes (see below). 10 This banner displays the current Summoning character and any Events. Here lies the game’s richness: each type of combat has different conditions and demands which the player must adapt to. A single player will build many teams, each of which approach battles differently in order to win the objectives of each stage. 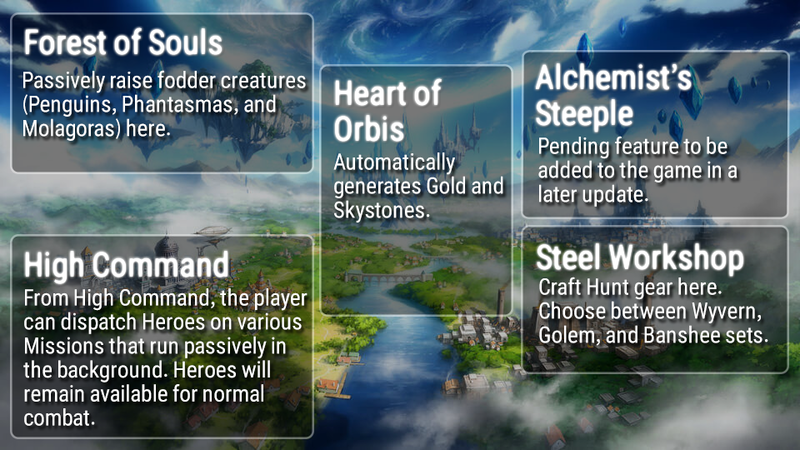 Adventure is the standard Quests that make up Story Mode.These maps will be primary targets for progression grinding, especially since they drop Catalysts, gold, and fodder monsters. 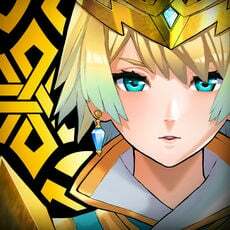 Arena is Epic Seven’s Psuedo-PvP mode. Another player’s set of designated heroes (Defense team) is controlled by AI while the player battles them. The Labyrinth is a dungeon-crawling, endurance-based challenge in which the team must fight through a branching map while maintaining high Morale. Losing Morale and playing inefficiently leads to Exhaustion and heavy stat penalties. The goal for these maps, aside from reading the story, is finding good gear and occasionally shops. The Abyss is a continuous dungeon with 90 floors. Completing each level will unlock the next one, with each floor becoming consecutively more difficult. The floors have very valuable rewards, and completion is is a slow grind and challenge that continues all the way into late-game. Hunts will be the main source of farming gear. Wyverns, Golems and Banshees each represent one of the three main elements, and have differing strategies for progressing to further levels. Like in the Abyss, each level becomes progressively more difficult, with the final stage being 11 for each Hunt. Spirit Altars are another series of material maps. Farm these to gain Runes for Awakening Heroes. Challenge Battles are rotating battles that drop various rewards. Events or Side Stories usually feature a single member or portion of the cast in a campaign similar to Adventure mode. These typically last about two weeks. Raids are similar to Labyrinths, but with a higher difficulty and multiple bosses. Guild Wars take place as a competition between player-owned Guilds. 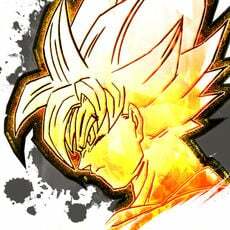 Victories here award Mystic Medals for summoning. 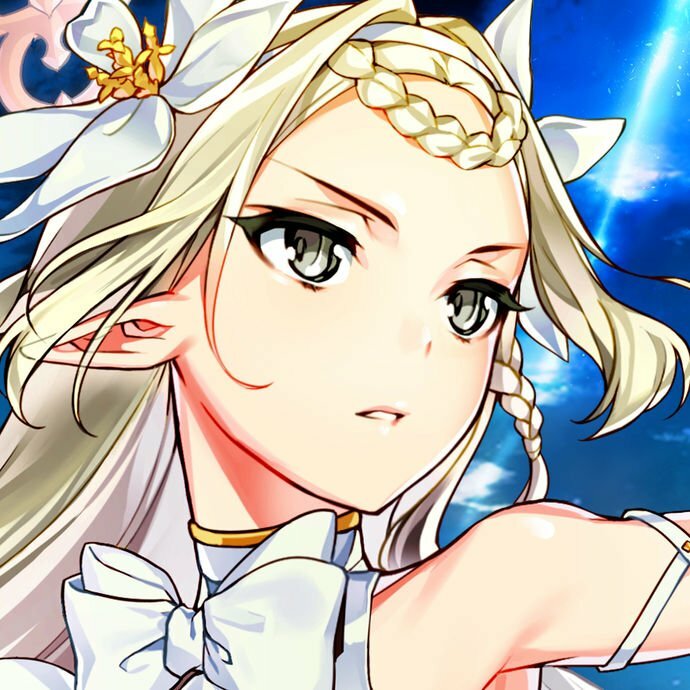 Due to the vast amount of content, Epic Seven has a number of methods for early-game progression. Hunts: These drop crafting materials used to create different sets of gear. Many players recommend focusing on Hunts since running it only requires Energy, and each typer of Hunt drops different sets of gear. Wyvern Hunts are the main focus since they lead to Speed, Critical and Hit sets that are good on most characters. Abyss: The Abyss drops a variety off resources including gear, Skystones, MolaGoras, and Transmit Stones. While it's time-gated and thus not as efficient as Hunts, the Abyss does contain a variety of levels with different challenges. For learning gameplay and mastering various game mechanics, the Abyss is a very good place to focus efforts. Labyrinth: Labyrinth maps are also time-gated, and even slower than the Abyss. Aside from being fun, they also drop decent-quality gear.